Long time readers of my blog might remember the Central Park Hoody. It was my first attempt at a garment and I was ever so pleased when I finally finished it....oh yeah, except I didn't ever finish it. I just started wearing it without any sort of button band, fastening instead with an old stitch holder I acquired somewhere, and tried to ignore the fact that the hood wasn't quite wide enough to cover my whole head comfortably. At first, I convinced myself it was a problem of finding buttons. I managed to make this excuse last over a year, until UK Rav day when the perfect buttons presented themselves, and Liz Lovick armed me with teh skillz. Since then it's just been laziness. But today, I finally bit the bullet! That's 157 stitches, down from the 221 I picked up with a 1.5mm needle and then decreased with a 5mm. It is so neat and perfect, I love how it looks. BUT MY HANDS ARE KILLING ME. The worst part is, I have to do the other side at some point. 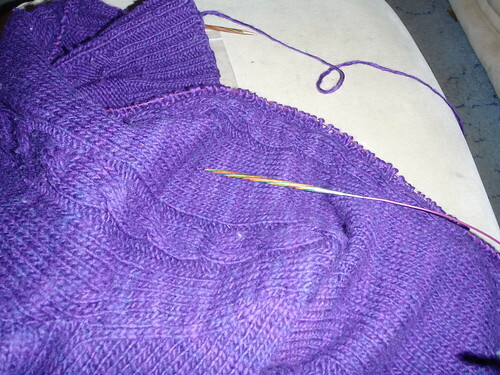 It will be like second sock syndrome - except, I have already had it as a wearable garment (unlike a single sock) and I can't wear it with one button band, so if I want this to be a wearable cardigan I will have to man up and do it. In other knitting news, the Hey Teach is done. It needs washing and blocking, and the buckle sewing on, and pictures taken, but it is done. Three weeks, from start to finish - not bad at all.